JBL Charge 2 Plus review | What Hi-Fi? The JBL Charge 2+ was originally launched at £150. And at even that price it’s knocking on the five-star door. At £40 less, we throw open the entrance and welcome a bone fide rival to our UE Roll 2 2016 Award-winner. A larger and heavier proposition than the UE – it weighs in at 600g; well over the UE’s 330g – the JBL also has some tricks up its passive bass radiator-equipped sleeve. Most intriguing is the JBL’s ‘Social Mode’ option. Here you can connect up to three Bluetooth-equipped music devices, letting, for example, a group of friends listen to each other’s tunes. Democracy in action, you say? A sort of democracy, we suggest. 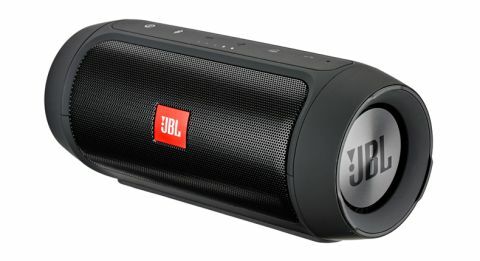 In Social Mode, to hear your tune you just hit Play – the JBL immediately stops what it was doing and plays your song. Or, in other words, to punt your mate off the virtual decks, hit Play. And vice versa. Great fun, well done JBL. And the fun doesn’t stop with playlist queue-jumping. The Charge 2+ is another of those Bluetooth speakers that doesn’t mind taking the odd shower. Though, unlike the fully immersable UE Roll 2, it is splash-resistant; it doesn’t mind hanging around the pool, but don’t ask it to take a dip. And, should your phone run out of juice whilst you’re on your travels, you can hook it up to the JBL – the built-in, rechargeable battery is good for up to 12 hours playtime. When it comes to kicking up a din, the JBL’s 15W speaker system uses dual external passive bass radiators to – according to the blurb – help you ‘hear the bass, feel the bass, see the bass’. We’ll reserve judgement on whether or not you will feel the bass, but wind-up the volume and you certainly can spot the bass radiators flexing their muscles. Spin something bass-heavy, such as Grace Jones’ smooth take on The Pretenders’ Private Life and the Charge 2+ delivers a big, far-reaching sound. This rich sonic character soon sends you searching for more low-frequency fun, and it wasn’t long before we were kicking back to Harry J Allstars’ Liquidator. The speaker is not, though, solely for big-bass duties. Switch to Jason Isbell’s delicate How To Forget and the JBL reveals good levels of detail – that gentle acoustic is apparent – and the former Drive By Truckers member’s vocals are full-bodied and emotional. Listen longer and you realise that the JBL invariably sounds big and impressive – great for even larger rooms – but also tends to wrap tunes in a (slight) film of audio warmth. The musical equivalent of wrapping your tunes with sonic bubble wrap. It remains extremely likeable, but the low end is certainly overstated if still agile. There is no need, though, to check the build quality before you invest. This is a superbly well put-together Bluetooth speaker. The rubberised finish looks and feels great, plus helps ensure a firm grip when you grab the unit. The soft-touch control panel is sensibly located and perfectly responsive, while the slightly raised base creates a steady foothold from which the JBL can ladle out rich helpings of music. No complaints here. The JBL Charge 2+ is a supremely likeable portable Bluetooth speaker. Its sonic character is bold and beefy, and we expect lots of listeners will warm to its, well, warmth. It also feels good in the hand, and the track-sharing Social Mode is a cool touch. For many, this JBL will be just the room-filler they’ve been looking for.